The Elements nutrient range is a premium, synthetic nutrient range, formulated to support hydroponic plant growth in a broad range of applications, including plant growth in clay balls, ebb-and-flow systems, deep water culture (DWC), nutrient film technique (NFT), and soil/potting mix systems. The Elements base nutrient range is separated into two formulations, which are specifically designed to fulfil nutrient requirements during the two major stages of plant development. 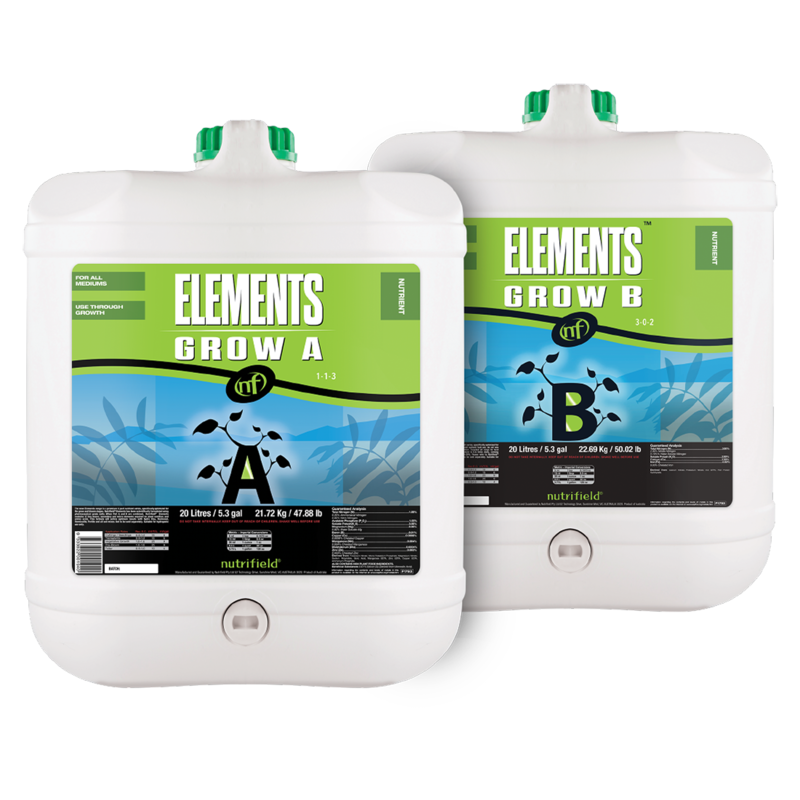 Elements Grow A&B is formulated to promote leaf, stem, and root growth during the vegetative growth cycle and Elements Bloom A&B contain the ideal nutrient ratio to support flower and fruit production during the flowering growth cycle. The combined nutrient profile contains all essential macro and micro nutrients, with an optimised NPK ratio, and chelators to ensure nutrient bioavailability. 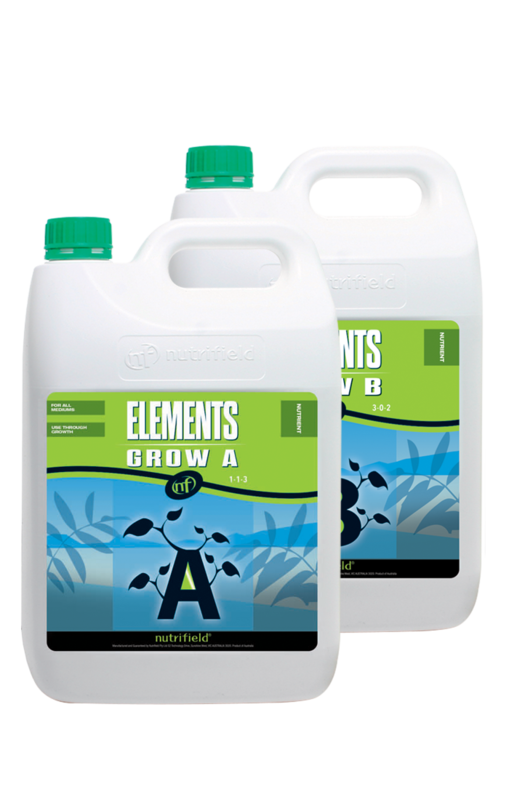 The Elements base nutrient range is split between Grow A&B and Bloom A&B to provide gardeners with complete control over the nutrient profiles. This allows gardeners to adjust and match the nutrients they provide their plants to the changing requirements of the vegetative and flowering growth cycles. The Elements Grow A&B has an NPK ratio to match the plant’s needs during vegetative growth, and Elements Bloom A&B contains increased phosphorous (P) and potassium (K) to match the plant’s increased PK requirements during flowering, associated with flower set, maturation, flavour, and hardening. The Elements base nutrient range achieves excellent results across a broad range of applications – including various growing systems, growth substrates, environments, and plant species. The clean, synthetic formulations are less accommodating to microbes and pathogens, which keeps your growth system cleaner and improves the longevity of sprayers and pumps. Nutrifield Elements Grow & Bloom were created through intensive plant research. Our research encompasses all aspects of nutrient processing and plant reactions taking into account both internal and external environmental stimuli. Nutrifield Elements Grow & Bloom are the fruit of our intensive research.